Jess Svoboda’s having a massive sale online at the Svoboda Warehouse on eBay at the moment. It’s no secret that I’m a big fan of the Svoboda range of denim, so when the opportunity came along to buy a pair of jeans that would normally set me back US$130+ for under US$30 (plus prohibitive shipping) I had to stock up. I indulged in a new pair of skinny jeans to wear under my boots this winter, and a pair of light wash bootlegs for every day wear. I love ’em both, but as usual I’m having the perennial issue of the self-unzipping-fly. I know I’m not the only person who suffers this indignity so I’m putting forward my extremely simple fixit for the problem. How do you go getting boots that fit your calves with jeans tucked in? I’ve been having a lot of trouble finding any to fit me and I would have thought I had very similar sized legs to yours. I’ve seen stretchy fabris type boots online, but yours look more like normal fitted leather ones. yep they absolutely ARE normal leather boots – Try http://www.duoboots.com which is where these came from – it’s a UK company that sells boots not just by foot size, but by leg width too. Lots of different styles and choices. Otherwise I have a pair of custom made boots from an Australian company called “Boots for Broads” http://bootsforbroads.myshopify.com/ It’s a much smaller range, but for AUD$250 they’ll custom make a pair of boots specifically for you. Hair elastic!! GENIUS!! 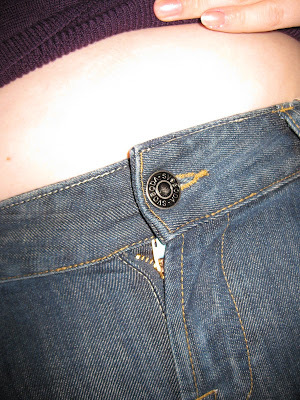 I have a couple of pairs of pants that your have salvaged for me with this little trick! thanks so much! Looking hot missy!! Love that jeans tucked into boots look – never been able to pull it off myself, but maybe I’ll give it another go this winter – you’ve inspired me! ingenious! And I LOVE your style, absolutely adorable! Are those the Avignon boots Lilli? Hi Lillipilli – just found and am loving your site and style! I’m keen to try the boot over jeans look… if I could get a flattering pair of skinny jeans and the boots to go over them! Hi Emma, Good spotting! Yes they are the Avingnon boots – they’re new (bought especially to wear over jeans, lol) and I’m quite pleased with them. The only thing is they seem to be about a size too big – my toes come halfway down the shoe! Plus I must have reeeeeaallllly long calves, because I always find Duo boots don’t quite make it to my knees. Otherwise they’re great! Thanks Lilli – I did find a pair of Simones but they were ridiculously long for my short legs. Have ordered a pair of Ezibuy instead – cheaper and easier to return if needs be. My zipper is ALWAYS falling and the safety pins are getting on my nerves, love your suggestion! Thats a great solution to the self unzipping fly! 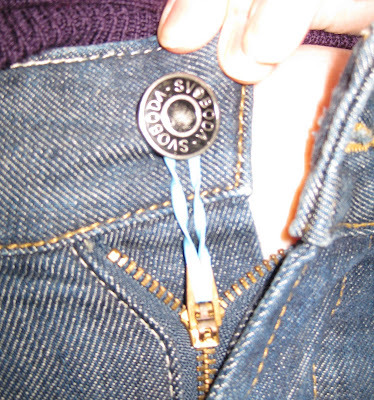 I’m going to try that so I can spare myself the indignity of having other people telling me my zip is undone!! I love you, you are beautiful!